The first of the baked highlighters is the purple one on the top right of this palette, Hemisphere. This looks incredibly bright in the pan but much more subtle once you start using it. This is pretty on the inner corners of the eyes and the tops of the cheek bones. Subsolar is a sheer pale shimmer, this will be too pale for darker skin tones except on the eyes. 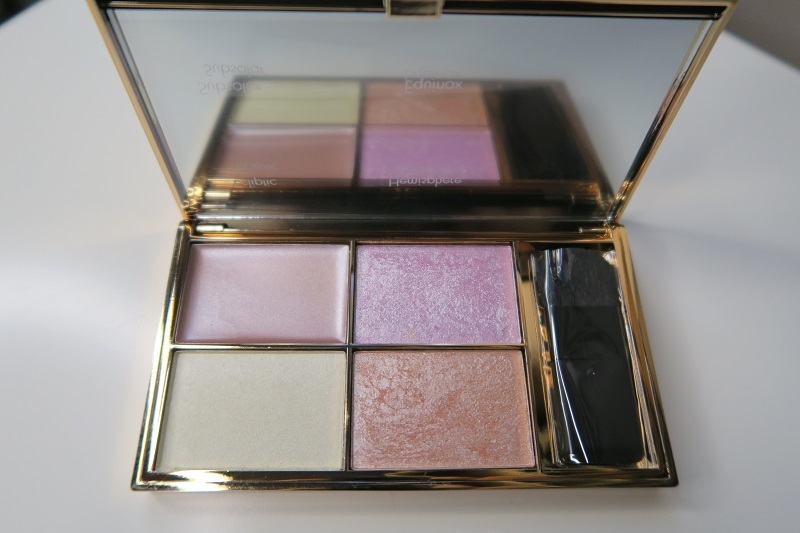 If I was going to use a highlighter (from this palette) on my collar bones and decollete this would be the one. As the finest it would be the most subtle. This is also the one that works best under the brows. The last is a tan/peach colour baked highlighter, Equinox. Another which may look a bit full on in the palette but is really pretty when used right. This is my favourite to use on the inside corner of the eyes - noticable but not to full-on. With all the powders a little goes a really long way. Use too much and you will look like you were in an explosion at a glitter factory. Which may be the look you are going for but for me I want highlighter to look more natural. As with all make-up you can build this - there's no need to go in all guns blazing as you can't blend it out so easily. The packaging is pretty good. It feels quite light and plasticky but for the price point it's really not bad. The fact it doesn't have a clear, crackable plastic front is a plus for me. I'm not worried about how it will travel, though I haven't dropped it yet! I don't like the brush, but they have to include a brush and at that price, it's not going to be great. If you have this palette you will probably have other brushes you can use and if you don't this one will do. I'm a make-up artist, I'm going to picky, doesn't mean you have to throw it out without trying it first. There's not a lot of excess packaging - a bugbear of mine - and the pans are of a decent size. The lid only opens to a 90 degree angle. This isn't a problem for me but it may bother some. Just so you know a couple of things I've seen that I disagree with. 1) The packaging is not rose gold. It's gold. As you can see. 2) This doesn't give you a 'lit from within glow'. It's much too shimmery for that. If you want that then I've yet to find an affordable dupe for Hourglass Ambient Lighting Powders.